Janet K. Manuel, deputy director and diversity inclusion officer for the City of Pittsburgh, answers questions from students. Diversity and inclusion in the workplace was the focus of a human resources panel discussion hosted on campus Oct. 30 by Point Park University's Student Human Resource Association, Black Student Union and Honors Student Organization. "The topic of diversity and inclusion is incredibly relevant to the world right now, even if you aren't an HR major. We wanted to learn more about what the best practices are on how to incorporate diversity and inclusion into the workplace and the difficulties that may come with it," said Kristen Blazeyewski, a junior HR management major and chair of SHRA's panel discussions. Babette Raabe, Ph.D., global human resources director for PPG Industries, Inc.
"Today's global environment necessitates the need for organizations to proactively embrace not just diversity, but also inclusion. Studies are showing that inclusion enhances decision making, communications efforts and profit for organizations," explained Sandra Mervosh, M.S., SHRM-SCP, SPHR, assistant professor and coordinator of the HR management program at Point Park. Students networked with the panelists, asked questions and were encouraged to further explore the importance and application of diversity and inclusion in the workplace. "This topic has always fascinated me as it is one of the most complex and sensitive. 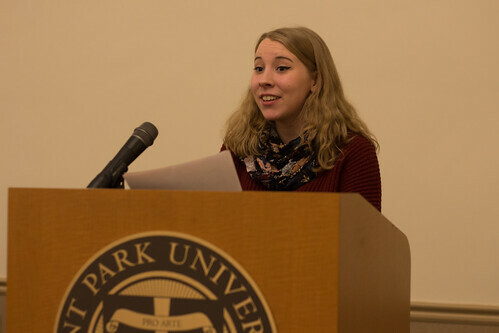 It was interesting to hear opinions from diverse representatives and their outlooks on how to handle different situations," said Deanna Kushnirenko, senior HR management major and an international student from Ukraine. Kushnirenko added, "It was a good discussion. I would like to continue expanding my knowledge on diversity issues in the workplace."